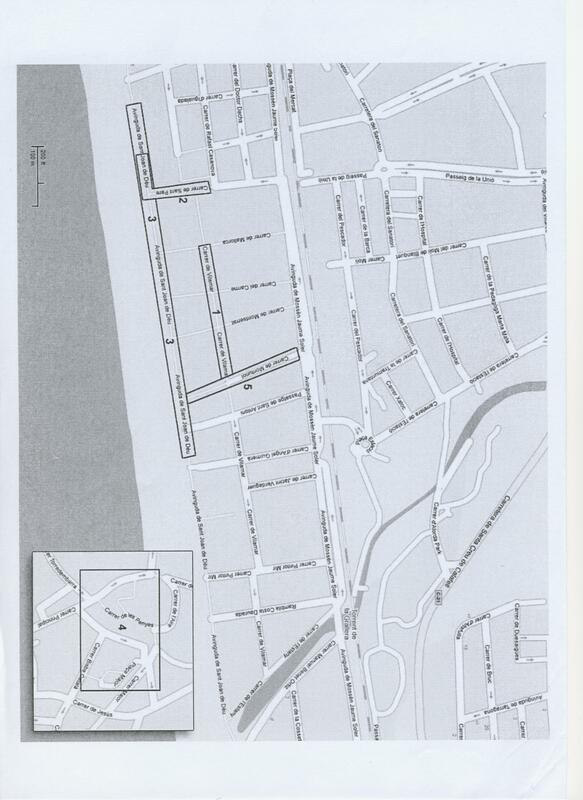 Sitges and Calafell are approximately equal-sized settlements lying to the south west of Barcelona (see Figure 1). Both rely on tourism as a major source of income and employment and the study aims to compare the relative success of tourism, in its various forms, by employing the Butler Model. The Butler Model is a method used to study the evolution of tourism over time and at which stage of the development model a settlement happens to be at this point in time. Tourism is a major source of income for many settlements and those on the Spanish coastline are no exception. The increased leisure time that people now have as a result of longer paid holidays, lengthier retirements and shorter working hours and weeks. An increase in disposable income. This refers to the money available to the individual or family once all fixed costs, such as mortgage or rent, utilities, food etc have been paid for. The greater ease of travel with developments in air and land transportation. 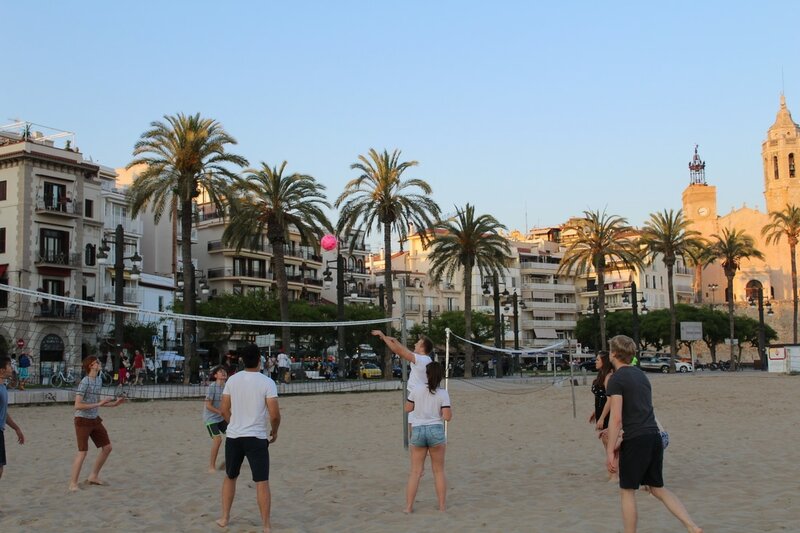 Both Sitges and Calafell have developed for these reasons. Sitges is a town of approximately 25,000 people and is located about 30 km south of Barcelona. Originally occupied by the Romans on a defensive headland looking out to sea, Sitges’ port was used to trade products from the Penedès region and other places from the Roman Mediterranean. Despite its direct contact with the sea, the town had more peasant farmers than fishermen, with vineyards being the main economic activity. In the 18th century Catalonia obtained permission to trade directly with the West Indian Spanish colonies and by 1833 more than 27% of the Catalans trading with Cuba were Sitgetans. The fortunes made were invested in the purchase or repair of the town's old houses. Sitges, although located close to Barcelona, was still hard to access at the time, but began to develop as a summer resort for taking the waters. As early as 1879, there are records showing that baths were already being used as medicinal therapy and spa enthusiasts directly became beach enthusiasts. However, it was not until 1881, with the arrival of the railway line from Barcelona, that tourism in Sitges really began to develop. With the arrival of Santiago Rusiñol in 1891 - one of the architects of Modernism - Sitges became the cultural centre of the modernists. In 1909, Sitges was visited by Charles Deering, a North American millionaire who converted a street in the historic core into a palace, the Palau Maricel. This palace and Rusiñol’s residence helped launch Sitges to tourist fame. In 1918, the Terramar garden city and the Passeig Maritim or Esplanade were constructed. Atracción de Forasteros (Tourist Attraction Company) was created in 1928 and the Tourist Information Office in 1934. From then on, Sitges would become a European tourism standard setter. Task 1. Read the information to the left and watch the video (sometimes a bit cheesy) making notes of all of the human (festivals, hotels etc) and physical (climate, beaches etc) attractions that Sitges offers year round. Let's hope this guy isn't there to annoy us! Calafell has a population of approximately 25,000 people and lies 50 km south of Barcelona. It owes its origins to a castle and occupied a defensive site on an inland hill. The name Calafell means 'small castle' and the earliest reference to it dates from 999AD. For years the economy of Calafell was devoted to agriculture and fishing. Like Sitges, the arrival in the late 1880's of the railway from Barcelona led to a change in its economic fortunes. Calafell became more accessible and the development of second homes around the railway stations flourished with the 1947 Garden City project known as the Quadra de Segur. At first people lived there only during holiday periods, but now the majority of the population are permanent residents. It was not until the 1960's that tourism began to develop strongly in Calafell, especially along the 5km of uninterrupted beach where numerous apartment buildings and hotels were constructed. With the blessing of successive city councils, a huge speculative boom in the 1970's led to an endless row of 6-storey apartments facing the sea. Later regulations prevented excessive vertical growth whilst inland the prohibition of building over two and a half floors led to more green space and a lower population density. Today, the town of Calafell is delimited into three very distinct areas. To the north, narrow streets surround the castle and the old church. To the south, and disconnected from the historic core, the former seafront fishing village has been converted into tourist area. 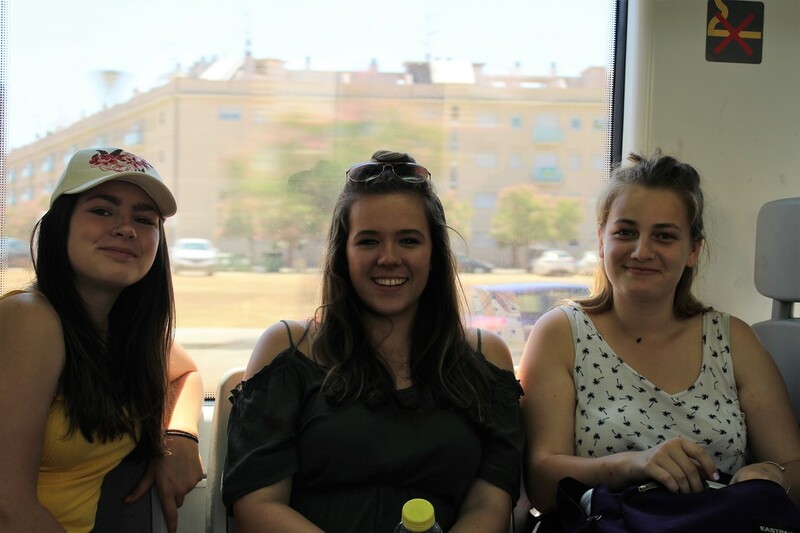 And to the east is Segur de Calafell, a former Garden City of second homes developed on farmland surrounding the railway station. Task 2. Read the information to the left and watch the video making notes of all of the human (festivals, hotels etc) and physical (climate, beaches etc) attractions that Calafell offers. Post Visit - Data and IA write-up. 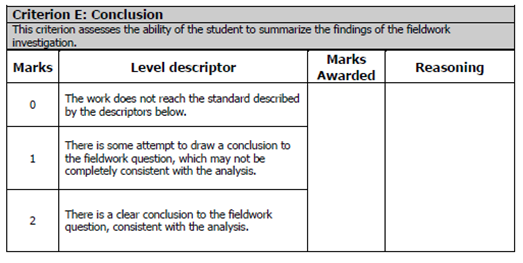 A written report based on fieldwork is required. ii. The coursework accounts for 20% of the total SL grade and 25% of the HL grade. iii. 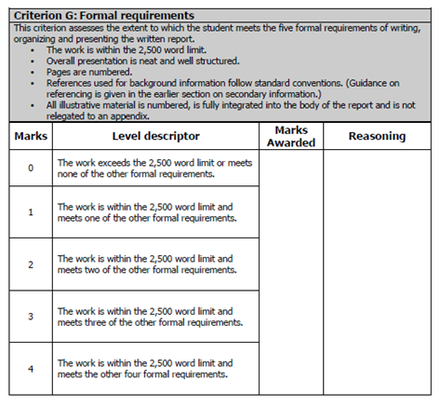 Six sections (A-F) and one formal requirements section (G). 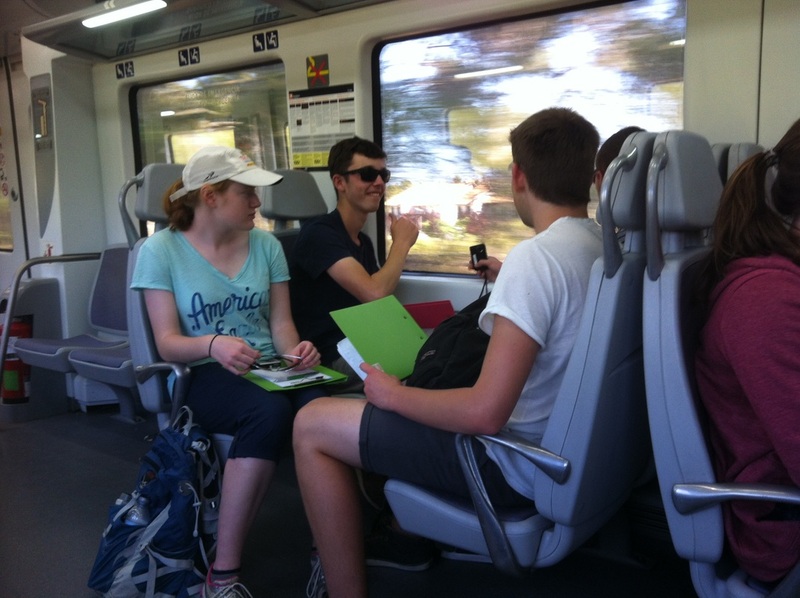 ​Sitges & Calafell: A comparative study of two contrasting tourist resorts. The aim of sustainable tourism is to meet the needs of present tourists and host regions while protecting and enhancing environmental, social, and economic values for the future. The aim of the study is to examine the extent to which sustainable tourism in Sitges and Calafell is being successfully implemented. Two RQ's (research questions) can be investigated. 1. How do tourist functions change with distance from the beach & promenade? 2. Are the two resorts at the same stage of the Butler Model? 3. How & why does tourism development differ between the two resorts? 4. Which resort is best geared to tourism sustainability and growth? 5. Do management techniques and policies used to avoid and resolve pressures and conflicts on the seafront vary between both resorts? You will then need to formulate a hypothesis test again your chosen two research questions. 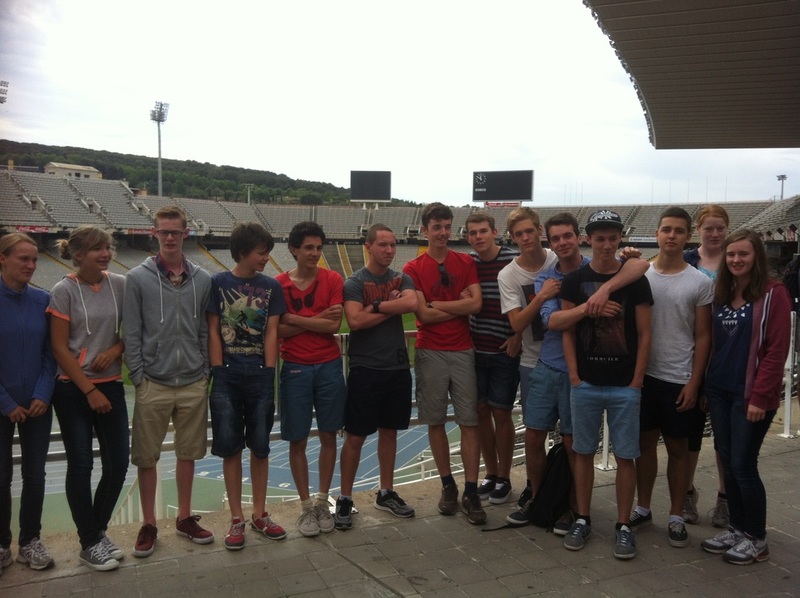 When and where did we go and why was the Costa Dorada chosen? 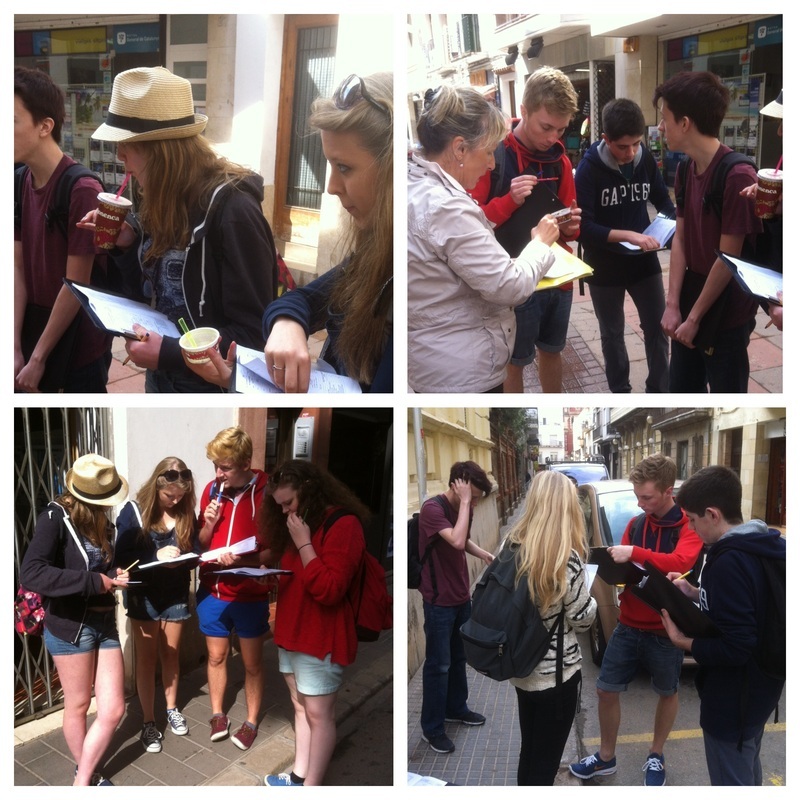 History of tourism in Calafell and Sitges. Map of Spain with Calafell, Sitges, Barcelona & Madrid located and written description. Map of the coastline from Barcelona down to Calafell with Sitges also marked on there. State the usage of primary and seconday information. Be sure to define what each means. Explain that both resorts were split into 5 similar land use zones and that in four groups we surveyed each zone and shared results in the evening debrief. Include a copy of each of the three or four surveys and explain why the weighting is different on many of the surveys. Explain how each method will help you to answer your research questions. Try to avoid being repetitive in this section! 4. Statistical analysis – explain what methods we used to determine patterns and enable us to identify relationships. 5. Include some annotated photos to show you/us in the field conducting the research - like the one to the right! 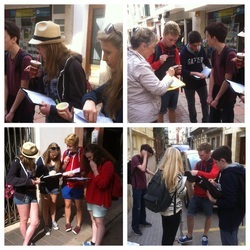 Hard at work in Sitges! There is no point re-creating all of your tables of data for the sake of it. One copy of this can be sent to the moderator. 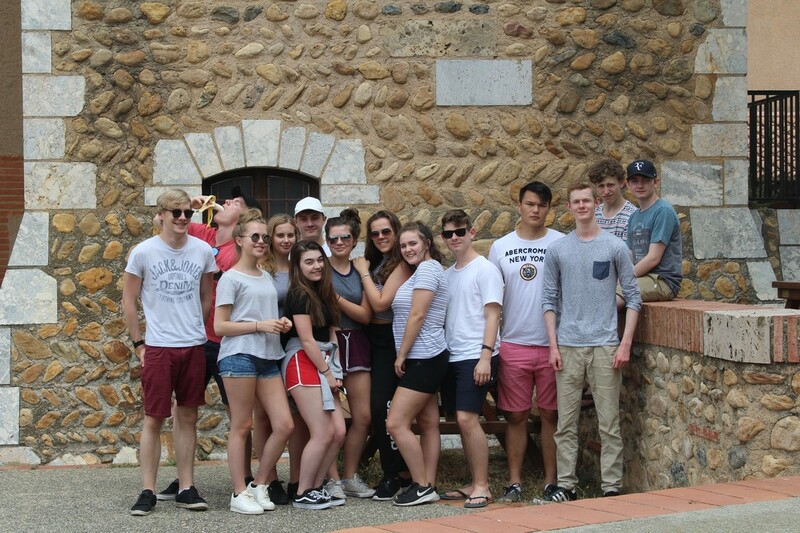 You need to have access to the excel spreadsheet that Y12 students made whilst in Spain. You visited five similar sites in two different towns giving you 10 sets of data to compare. Do you need all this data or can some be combined? Map to show location of both areas. Sustainable Tourism Management – simple comparative bar chart with each of the categories shown clearly. Same scale must be used on x & y axis for both. Index of services and amenities. Again, comparative or spatial charts to show different categories and their weighting towards tourists, locals or both. Annotated photos again could help here. 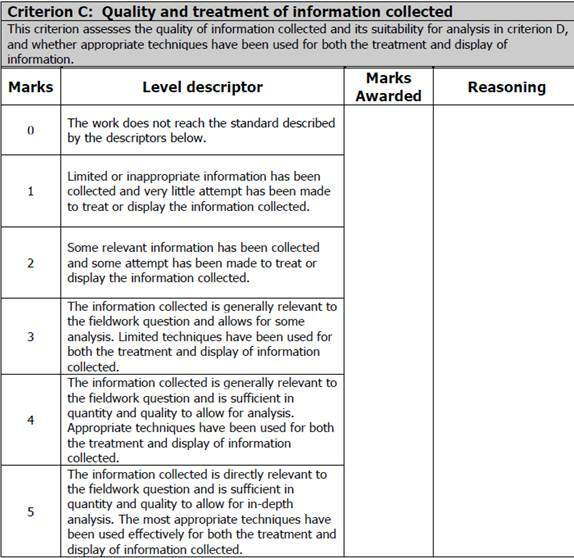 Environmental Survey – Total scores for each of the six categories. You will need to write out commentary for each of your data presentation pieces. I suggest that you type this on a separate piece of A4 paper that will be inserted just behind each of the display sheets. This work should be concise and attempt to answer your questions whilst testing your hypothesis. Make sure you link back to the questions and the hypothesis at the end of the interpretation of each location. Are the two resorts at the same stage of the Butler Model? 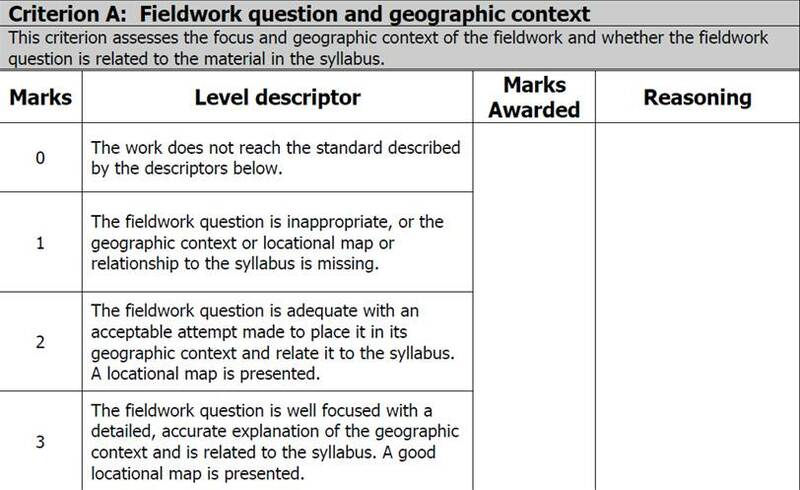 (Summarise what you have found with specific examples to compare your point with the secondary data GeoActive article by Paul Sheppard) Use this sheet to help you to record your thoughts on both resorts in relation to the Butler Model. Which resort is best geared to tourism sustainability and growth? Make sure you understand the concept of sustainability especially related to the tourism industry (VITAL and will require some additional reading and revisiting past SLT work). Social, economic and environmental sustainability should be considered here. 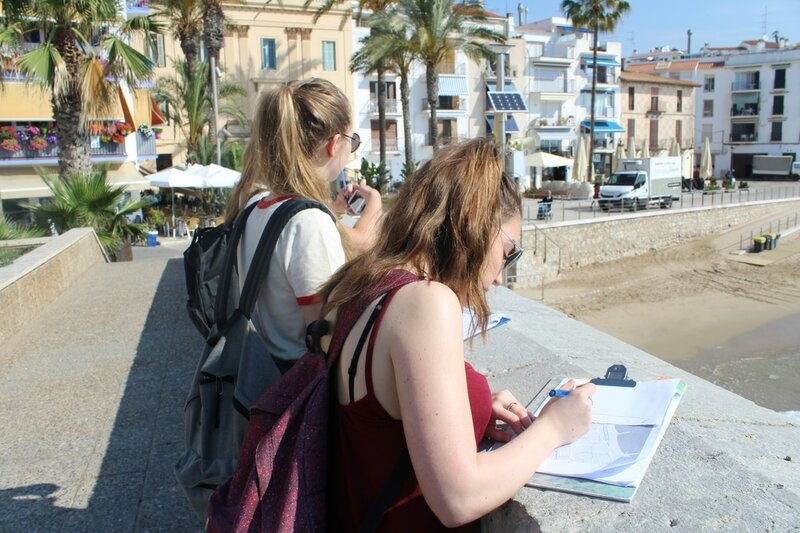 Make reference to data and observations directly from your presentation sheets..
You should summarise the findings of your fieldwork investigation in Sitges and Calafell. There should a clear and concise statement answering two research questions. b) Which resort is best geared to tourism sustainability and growth? c) Where is each located within the Butler Model? 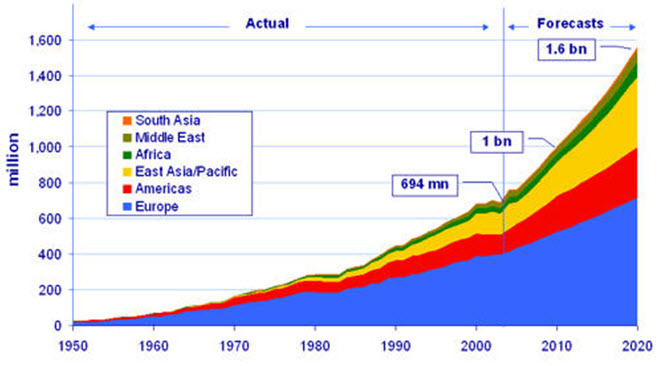 Tourism sustainability declines with distance from the historic core and sea front. You should review your investigative methodology, including methods of collecting primary data, including personal bias and unpredicted external circumstances, such as the weather. You should suggest specific and plausible ways in which your study might have been improved and could be extended in the future. 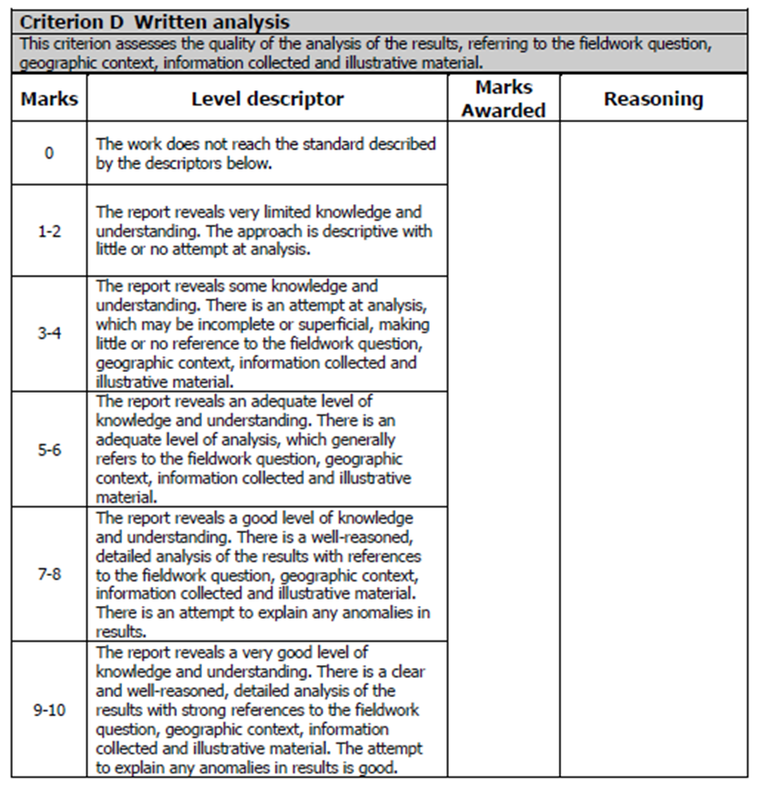 For some reason, the IB chief examiner does not like the methodology being in a table format. So, we are going to write this up method by method as a 'normal' piece of work. 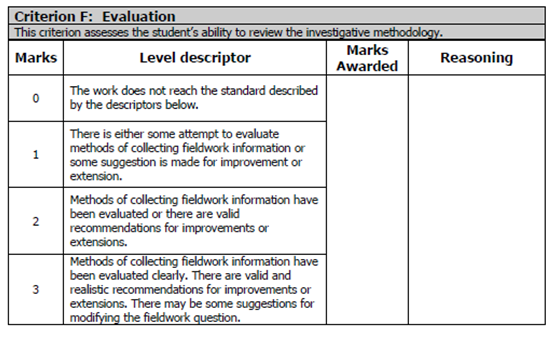 To access the highest marks, you must make VALID and REALISTIC recommendations for improvement or extensions of the fieldwork task. You might even suggest modifying the original research question. 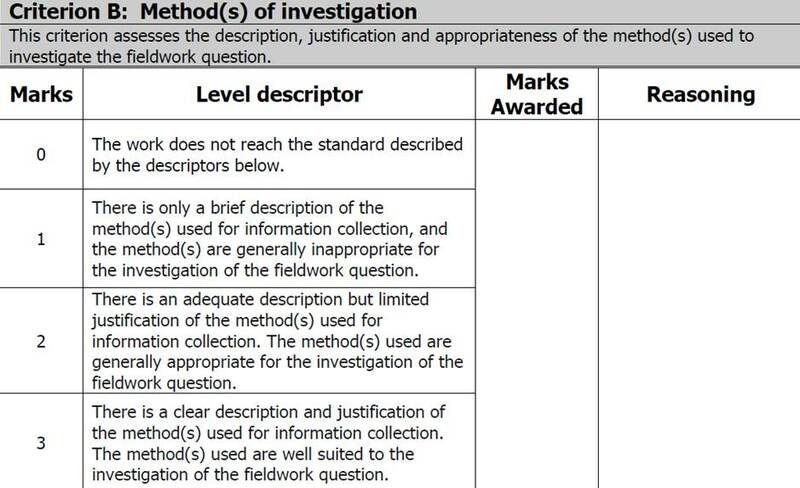 Study the mark scheme to the right hand side carefully. Have you completed all the requirements as set out here? This is worth over 10% of the total grade for IA. It is definitely worth getting those extra points in the bank to give you a safety cushion in your examination. To ensure that this is done correctly, you may use the following Havard Citation Generator from Mr Tarr's ClassTools site.